606 pages | 48 Color Illus. | 57 B/W Illus. 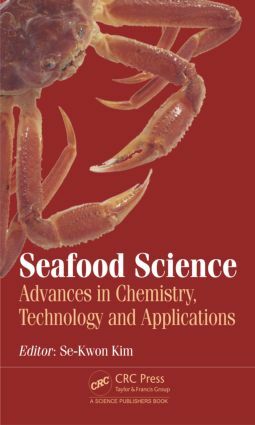 This book explores current trends in seafood science and examines various related topics including isolation aspects and different methodologies involved in seafood production. It provides detailed explanations about marine species such as fish, seaweed, and crustaceans and discusses their health benefits as well as the health risk for consumption. These topics provide a platform to develop various aquaculture/biotechnology studies. The book is essential reading for the novice and expert in marine-related fields such as aquaculture, as well as those in biotechnology, chemical sciences, natural products, materials science, pharmaceutical science, and nutraceutical science. Introduction to Seafood Sciences. Fermentation Method in Food and Derivatives. Seafood Cooking Method in Nutritional Quality. Fish Skin as Useful Additives. Fish Protein Coating to Enhance the Shelf Life of Fishery Products. Fish Protein Coating to Enhance the Shelf Life of Fishery Products. Determinationing Technology in Fish Quality and Seafood. Recovery of Fish Protein Using pH Shift Processing. Cold Gelatin for Seafood Restructuration. The Role of Transglutaminase Enzyme in Improving Gel Properties of the Fish Gel. Effect on a Fish Quality and Preservation Technique of Degradation Products of Trimethylamine-N-oxide. Dioxin in Fish. Chitosan: A Booming Bio-Based Nanocomposite in Seafood Industry and Aquaculture. Recent Development in the Area of Shrimp Quality Evaluation, Optimization and a Case Study of Tracebility System. Immune and Antiaging Properties of Bioactives Extracted from Seaweed. Chemistry, Technology and Applications of Food Hydrocolloids from Seaweeds. Arsenic in Seaweeds: Presence, Bioavailability and Specification. Sea Cucumber Aquaculture. Application of Microbial Fermentation in Seaweed Processing. Handling and Processing Technology of Indonesia Seaweeds. Application of Seafood by Products in the Food Industry. Biological Properties of Seafood Processing Byproducts. Freeze-Dried Seafood Products. Selenium-Health Benefit Values as Seafood Safety Criteria. Role of Bacteria in Seafood Products. Fish and Shellfish Diseases.